Industrial strength simulation software for improving the performance of real systems. Vensim's rich feature set emphasizes model quality, connections to data, flexible distribution, and advanced algorithms. Configurations for everyone from students to professionals. Vensim can be used to improve decisions anywhere there are problems with detail and dynamics, which is to say, everywhere. Ventana’s consulting provides many examples. Our customers apply Vensim in energy, health, climate, education and many other areas. Congratulations to Navid Ghaffarzadegana, Xue Yi and Richard Larson for their publication in EJOR, Work-education mismatch: An endogenous theory of professionalization. Vensim 7 Synthesim + Sensitivity https://vimeo.com/223688311 In Vensim 7, we’ve combined real-time Synthesim with sensitivity analysis, so you can see the distribution of outcomes from Monte Carlo runs interactively. This is great for giving users an appreciation of the risk associated with a decision, rather than just a best guess. 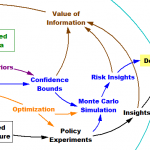 Data Science, Connected to the Bottom Line https://vimeo.com/206297867/1d77447143 Vensim can be used to put big data in context, by incorporating the learnings from big data in simulations that account for organizational structure and finances. Vensim can also do data intensive simulation, with flexible I/O, advanced algorithms for calibration, optimal filtering, confidence bounds and Monte Carlo simulation. 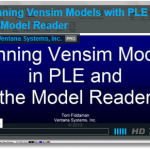 Running models with Vensim PLE and the Model Reader A brief tutorial on running models with Vensim PLE and the Vensim Model Reader. 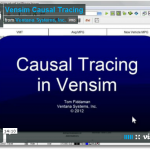 Causal Tracing in Vensim A tutorial on Causal Tracing™ – following the chain of causality through a model for insight and debugging. Lookups in Vensim A tutorial on building and using lookups (table functions) in Vensim models. 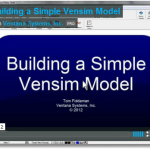 Building a Simple Vensim Model A quick tutorial on building and running a new Vensim model.